To power the system, hit the “Start” button. This will take around 30-40 seconds to complete. During this time you can lower the projector screen, which must be done manually via the switch on the east wall, just to the right of where the screen comes down. 1. Home: Pressing this button will bring up a screen asking if you want to power the system off or not. It is the same as button #9, Power. 2. Source: Hitting this will bring up the Source page, where you can select which input source you would like displayed from the projector. An input can only be selected if a signal is present, signified by a green circle. Resident PC: This is the podium machine located under the touch panel. If there are any issues with this machine try restarting it; it will automatically log in to the Monsanto account. Doc Cam: Source for the podium’s doc cam. If circle is red, make sure the device is on. 3. Microphones: This button allows you to change the volume level of each microphone. Microphones and stands are stored in the bottom left of the podium. The Monsanto room has three wired connections, the first is labeled “Podium” and this is the only mic that has a mute button (a red square button underneath the microphone). The other two wired connections are on the floor and are rarely used. There are also five RF channels for wireless mics, with RF 5 being labeled as “Main Lapel”. The other four channels can be shared between lavalier or hand held microphones. *Note: Only one microphone can be used per RF channel at once, ie: you can’t use RF 4’s lavalier and handheld at the same time. *Note: The touch panel will display each mic’s volume at 0%, but it is actually ~80%. If you increase the volume by 1%, it will reduce the volume from ~80% to 1% and you’ll need to continue raising the volume until it’s above 80% to get any effect. Walkway Rail Lights: These lights are controlled by switches in outside rooms. If one is of these are off, Josh or Chad should be contacted. 7. 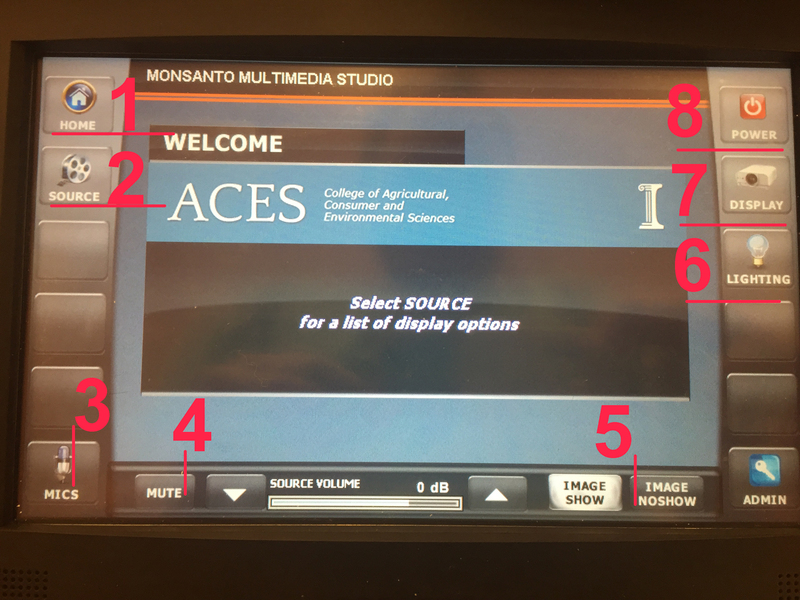 Display: Allows you to turn the projector on/off and to auto adjust the image. If the projector did not initially turn on when the system did you’ll need to go here to turn it on. As you hit “On” a red banner saying “Projector Warming Up” will display across the top. If the projector still doesn’t turn on after this banner goes away you will need to manually do so via the projector’s remote control or from inside the control room. 8. Power: Pressing this button will bring up a screen asking if you want to power the system off or not. It is the same as button #1, Home.